“Woman As___” runs from December 4th 2014 through January 18th 2015. TacoCat Cooperative Studios and Gallery. 937 Burrell Avenue Columbus OH 43212. Special performance by artist Heidi Madsen between 6:20 and 6:45pm. The exhibit is curated by member artists Catherine Bell Smith and Mollie Hannon. CAW and the Women’s Fund are compatible organizations with the same goal of empowering women. CAW is a group of professional artists representing a wide range of disciplines including: performance, sculpture, installation, photography, ceramics, painting, and printmaking. As one of the premier women’s arts groups in Columbus, CAW is committed to being a safe place for women to be nurtured in their artistic goals. CAW has also had a notable history of community involvement starting with the 2011 exhibit “Strands” which featured visual and performance art about hair, fibers, DNA and other “strands.” The proceeds of the exhibit were donated to the Hair Theater Fund, which helps patients experiencing hair loss due to chemotherapy buy wigs or hats. In 2014 CAW members embarked upon a three month partnership with Fort Hayes High School art students. The mentorships between CAW’s professional artists and Fort Hayes students resulted in the powerful exhibit “Exchanges” which blurred the lines of the mentor/mentee dynamic. The Women’s Fund of Central Ohio is a public foundation that transforms the lives of women and girls by mobilizing the collective power and passion of all women working together. The Women’s Fund creates gender equality and influence through its research and collaborations, promotes social change by growing women’s philanthropy, and by making grants to programs that raise awareness and educate on issues affecting women and girls. 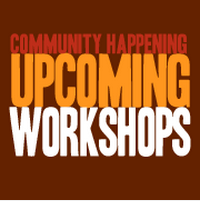 For more information please visit CAW, Tacocat or Womens fund of Central Ohio. After the opening, tacocat’s gallery is open on Sundays, from 12p – 5p. or contact one of the CAW hosts to schedule a personal tour! 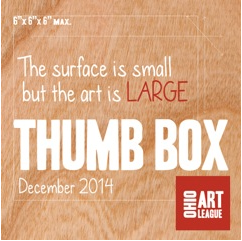 Thumb Box Exhibition: Small Surface, Big Art! Each year, the Ohio Art League puts on a non-juried exhibition, in which we display any of our members’ submitted works within the confines of a 6″ x 6″ x 6″ boundary. Thumb Box Exhibition allows our organization to proudly portray our members and their talents, despite the miniature canvas. Thumb Box will be exhibiting from December 4, 2014 through January 2, 2015 at RAW Gallery in Downtown Columbus. Don’t miss the Opening Reception on December 4 from 7 -10 pm! PS- Many of the members’ works act as perfect holiday gifts!! “Perception is reality, and I am fascinated how people gather fragments of what they decide is true and important– memory, stories, cultural influences, experiences, ideas and beliefs– and shape them into personal world views. I take fragments of the external world and weave them with invention and paint to create new morphing realities,” states OAL member Christine Guillot Ryan of her upcoming exhibition. ‘Converging Boundaries’ will be exhibited in the Cultural Arts Center Main Hall Gallery from September 5 through October 4, 2014. Don’t miss the Opening Reception of ‘Converging Boundaries’ from 5:30- 8:30 pm on September 5th. Guillot Ryan’s latest mixed media works explore the nature of our boundaries, the relationship between the intangible and the material world. Weaving fragments of representational imagery with paint, Christine creates new worlds that are vivid and richly layered, inviting imagination and provoking conceptual discovery. Christine exhibits locally and nationally, is a member of the Ohio Art League and CAW (Creative Arts of Women), Art and Artists of 614, mentors students at Fort Hayes, and teaches workshops at the Peggy R. McConnell Arts Center of Worthington and at the Cultural Arts Center. For more of her work and a schedule of upcoming exhibits, click on the link of her name at the top of the post to be directed to her website. Make sure you stay up-to-date with Ohio Art League as we integrate a blog into our home website!